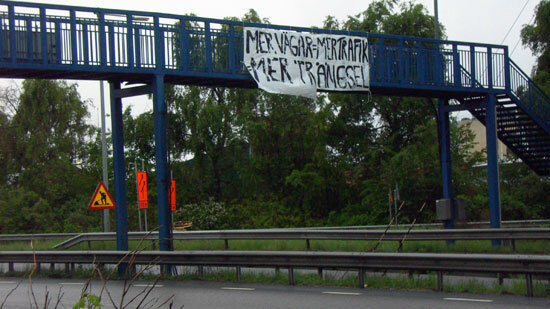 If the third runway in the UK is the proof of the country's climate hypocrisy then Swedenâ€™s would be the huge new highway projects in Stockholm and Gothenburg. 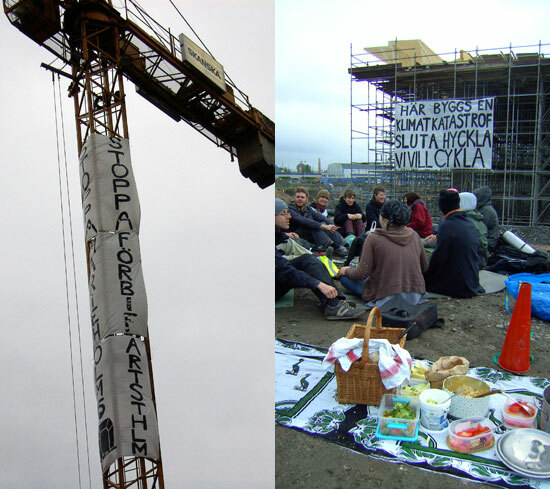 In Gothenburg, the second-largest city in Sweden, climate activists from Klimax and the Friends of the Earth "decorated" cranes with banners, planted trees and even had a breakfast on the construction site to highlight and protest against the climate highway madness being built in Sweden. "It's bad enough that large amounts of taxpayersâ€™ money is being wasted on projects that wonâ€™t work, but these road projects will even lead to an increase of carbon dioxide emissions. 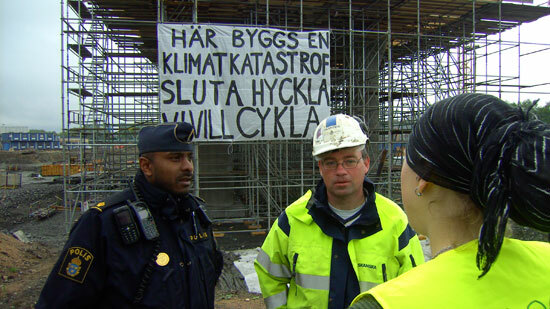 Itâ€™s ironically that that we activistsâ€™ risks getting arrested while the real criminals, who on a consciously and cynically way make decisions that will lock us into a continued increase of carbon dioxide emissions will go free. We just canâ€™t sit quiet while climate criminal politicians threaten future generations living condition; itâ€™s every citizenâ€™s obligation to put pressure on the decision makers so they make climate friendly choices", said Lovisa BÃ¶rjeson from Klimax in Gothenburg. "More roads = More traffic = More congestion"
"A climate catastrophe is being built here. Stop the sham. We want to bicycle." "This is one of the reason why some engineers are seeking knowledge about green construction especially now a days that global warming is quite a threat for all of us, the pollution from this construction sites can be simply reduced with the use of green construction methods. As for the protesters building the road is not that bad it is a part of the projects for the progress in their place"
I agree with you. We have to be sensitive in our approach to all types of construction large or small. i am planning to have a loft conversion, i surf the internet looking for some profesional help, i casme across with this site http://www.transworldconstruction.co.uk/Service... which show a lot of nice qualification, what can you say? Madness it is. Green thinking should not mean 'anti development'. An economy has to be built from somewhere. And the claim that more roads mean more congestion is insane. More roads mean less traffic, as any 5 year old will tell you. Same population spread over more surface = more efficient transport.